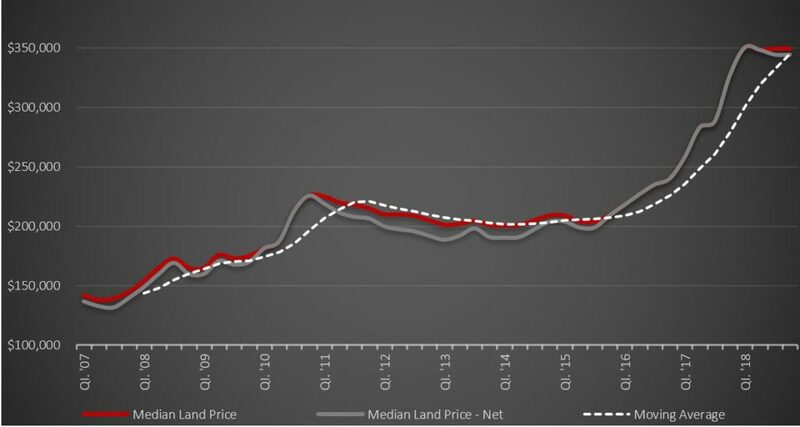 The median land price rose marginally by 0.7% to $347,500. Rebating further reduces the net median of around $335,000: a fall of ~$20,000 from its April 2018 peak (down ~6%). Mitchell (Beveridge, Wallan) is the most affordable municipality, and the only with a median below $300,000. Stock levels / available lots are also moving north. By the time you are reading this, we will have crept into 2019 (and I will be on holiday)! That said, 2018 is finishing in a different gear to that some 12-months ago at a number of levels, not just softening sales volumes. Twelve months ago, the Melbourne growth area median land price was gaining momentum, a record median of $318,500. A month-on-month increase of 6.5 per cent and a year-on-year increase of close to 32 per cent. The price would eventually peak at $355,000 late in the second quarter of 2018. Over the last 30 days, the median land price rose marginally by 0.7 per cent to $347,500. A year-on-year single digit increase of around 9 percent. Rebates / incentives push it to around $335,000. Down around $20,000 on the April 2018 peak. This equates to a fall in price of around 6 per cent from its peak. Net land prices fell by around 13 per cent from their peak during the last cycle (say $225,750 to around $199,000). A similar fall would place the median land price at around $310,000 – a further decline of around $25,000 and total fall from its peak of around $45,000. A median land price north of $300,000 still challenges the boundaries of affordability, particularly in an environment where there is only gradual wage growth (wage price index in Victoria, up 2.5 per cent). Stable, or even falling interest rates maybe the god-send. The outlook for household consumption is still send as a key downside risk to the outlook. 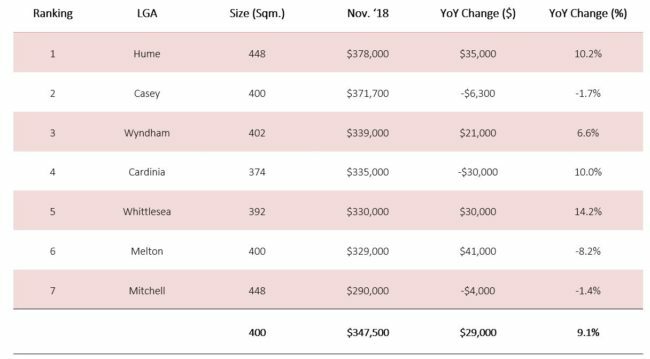 It is worth noting that rebates / incentives in the order of $30,000 to $50,000 are being afforded at some projects in Melbourne’s northern corridor. The median is currently around $10,000. Rebates / incentives as shown in the chart below were last in force around the third quarter of 2015, present from 2011 to around 2015. At this time annualised project sales were just creeping over 19,000 and on the rise. The land price was around $200,000. I think everyone is comfortable in the knowledge that enquiry levels and sales volumes have slowed, certainly sales volumes are down by more than 25 per cent down and maybe more. Across all municipalities an annualised sales figure in line with the long run trend is looking more likely for 2018, say 1,400 project sales per month. A lower number for 2019 is forecast, down a further 8 – 10 per cent. Referral fees north of $5,000 are also present. Stock levels / available lots are also moving north, more than 3 months retail supply. Red23 forecast this to climb to more than 6 months by the second quarter of 2019. The number of trading projects should increase from the modest current number. The median price by municipality is shown in the following table and it highlights, as to be expected, a number of differences from the same time last year. Not a single municipality is in the same ‘affordability’ position some 12 months ago; nor are the year-on-year changes anywhere near comparable. Hume is the most expensive municipality, as it has been for the last three months: a median of $378,000. Whittlesea has experienced the strongest year-on-year percentage growth: 14.2 per cent. This percentage growth would have positioned it as the worst performing region 12 months ago. The median price of lots released during November was $340,000, a median size of 400 square metres. Last month, the median price of lots released was $319,200 (399 sqm.). A 6.5 per cent variance. Ever fluctuating Cardinia showed the most promising month-on-month improvements having raised to fourth, increasing its median price by $16,000 or 5 per cent. Cardinia volatility tends to be driven by low stock levels and variance in lot sizing. We watch close recent impacts of recent APRA announcements in regard to supervisory benchmark on interest-only residential mortgage lending (https://www.apra.gov.au/) and the Planning Ministers recent commitment to tick off on a number of Precinct Structure Plans (https://vpa.vic.gov.au/greenfield/). 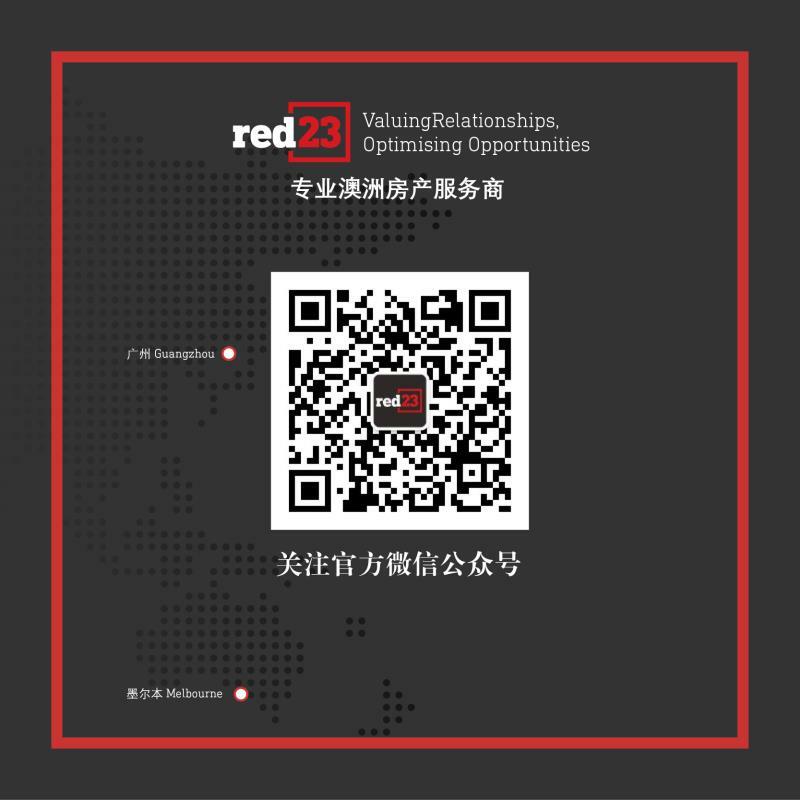 Red23 is a specialist marketing, sales and research partner for residential development businesses. Our passion and expertise are for new and establishing projects in the areas of land, medium density and mixed used property developments in Victoria, New South Wales and Queensland.